Surplus Thoughts: Elementary dear Watson - It's by design ! Elementary dear Watson - It's by design ! Its amazing how much of things around us include observations that provoke no logical thinking in our teeny weeny brains. I've had a string of phones from the Sony Ericsson T100, the (still surviving & immensely moddable) Motorola E398, an LG device, a Samsung Corby Pro to the latest acquisition (an android smartphone). And I never had any complaints against any of them. But they may have had a grudge against me. It has something to do with my passion for sleep. Yeah sleep!. Sleep is something that I treasure and its no small annoyance when the mobile phone attempts to awaken me with whatever mellow tone I have resolutely set the day before. Many a mobile phone has in its courageous attempts to convert me to an early riser, been dropped unceremoniously from a variety of heights and on a variety of surfaces. That was till yesterday, when I had a chance to put two and two together. The stimulus was a lecture by an eminent person who remarked that things were often designed to work in various ways and we never try to figure out why it works that way. He mentioned mobile phone(s) casually. And voila the neurons fired... the phone was actually designed to come apart that way. I confirmed it with him (somewhat of an authority on device design). 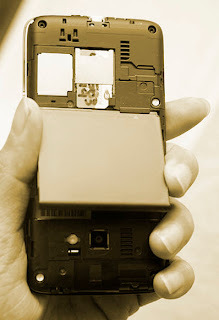 In the parlance of mechanical stress distribution, the coming apart of the removable phone components actually dissipates the energy and reduces further damage to the phone. This is by design of the phone itself. If the phone were a solid entity, the stress would be passed on to the internal components, damaging them beyond repair. Also what would be easier to replace - a broken back cover or a broken PCB ? So if your phone falls from a considerable height the next time and miraculously remains in a single piece - you better be mentally prepared for some service center visits ;-). Also all disclaimers here - please don't try this observation at home and pin the blame on me for a broken phone. The GraphJam entry below should give you a queer idea of the impact levels and damage (fun).